Paddy’s biographer and good friend, Artemis Cooper, will talk about his life in Greece at the Gannadius Library in Athens at 7.00 pm on 24 May 2012. 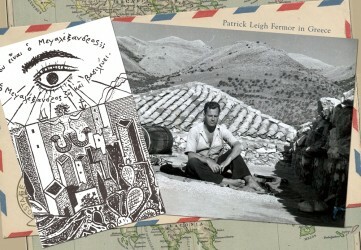 Biographer Artemis Cooper, who is preparing a biography of Patrick Leigh Fermor, will trace his life, experiences, and legacy in Greece from his early travels to the end of his life, on 10 June 2011. She will talk about what drew Patrick Leigh Fermor to Greece in the first place; his ‘participation’ in the Venizelist rebellion of 1935; his early travels in Thrace and Macedonia, and first encounters with the Sarakatsani; his experiences in the war on the Albanian front and Crete, as well as the post-war explorations of Greece that produced Mani and Roumeli. She will also touch on the Cyprus years; his friendship with George Seferis, George Katsimbalis, and Nicos Hadjikyriacos Ghika; how he and his wife came to settle in Kardamyli, and built their house with the architect Nicos Hadjimichalis; how the Greek translation of Mani was undertaken by Tzannis Tzannatakis, while he was in exile in Kythera under the Junta of the Colonels. She will also reflect on his position in the village of Kardamyli and how he is seen in Greece today. PS – I have been told that there will be a webcast available after the event. I will post the details when I have them. This entry was posted in An Adventure: Paddy's Biography by Artemis Cooper, Mani, Profiles of Paddy, Roumeli and tagged Artemis Cooper, Athens, George Katsimbalis, George Seferis, Greece, Kardamyli, Mani, Nicos Hadjikyriacos Ghika, Patrick Leigh Fermor, Peloponnese, Roumeli on April 10, 2012 by proverbs6to10. Great news, thank you HB, I’ll be tuning in religiously! I am going to attend, will try my best to get a sound recording! yes, a video or sound recording would be wonderful..
Any chance of a webcast or at least posting a video on this site? F. Harry Stowe. Harry, the mere mention of your name fills me with joy!! I have asked the Gannadius if anything will be made available. We shall see. Roger – good news ….